I was going to write about the lovely local excitement in Clare created by the arrival in fabled Bunratty down the road from Maisie’s cottage of three happy bottlenose dolphins, but dammit I'm being deflected by the even greater national excitement created by the arrival on the Irish market of the Tayto chocolate bar. To me it is what Charlie Haughey once described as a "GUBU"--grotesque, unbelievable, bizarre, unprecedented! But then I'm clearly out of step with the majority. Something I learned from trips over to you in recent years was the great hunger among you for Tayto cheese and onion potato crisps. If you brought over a few packs of them they were like gold dust to friends. At least as popular as smoked back rashers or tea bags of good quality tea. I noticed that all brands of potato crisps were called Taytos and were wolfed down with great relish. Is that appetite a strand of nostalgia for Irish childhood years? I do not know. I just know that it is there and strongly so. Myself? I doubt if I've devoured more than two or three packets of Taytos over the past 10 years. I can take them or leave them, and usually leave them. But the demand over the past week for the new Tayto chocolate bar has reached fever pitch. Amazing. I gather that the company, responding to consumer requests, produced about 100,000 bars as a pilot exercise and released them through just one supermarket chain. They are clad in the same livery as the crisps and they walked off the shelves immediately. It appears that the reaction to the new taste is so favorable that Mr. Tayto's folk are now working overtime to release a tide of Tayto chocolate bars for all the supermarket chains. We have a recession, we have many social and economic problems, we have had a continuing spate of bad and harsh weather and bad news but it does not seem to matter as much to the majority as laying hands and lips on one of the new bars. Amazing. For my money the special taste of milk chocolate does not mingle or meld at all with the cheese and onion flavor of salted slices of fried spuds. Surely the rich flavor of chocolate is strong enough and special enough to be relished by itself? Chocolate in all its forms has a special appeal for the ladies, I think, but most men like myself enjoy, for example, the popular bar of Cadburys chocolate. It has been a market leader here since even before Taytos came on the scene 50 years ago now. My memory goes back far enough to remember when the first potato crisps were without any flavor at all. You were even supplied with a little blue spill of paper containing the salt! The capacity to impregnate the crisps with a cheese and onion flavor did not happen for years. And that is when Mr. Tayto, in all fairness to him, came into his own. The word, just like Biro, is now part of the Irish everyday language. You don't ask the barman for crisps, you ask for Taytos. What a magnificent linguistic monopoly that is! Were the very first crisps a culinary accident like that which happened to the French chef long ago in relation to French fries? I quite honestly don't know or especially care. I do know, though, that the Guinness which is so often downed today in Ireland along with crackling Taytos is believed itself in Roscommon at least to be the consequence of a brewing accident. It is claimed that a batch of ale was overcooked and burned black in Strokestown and was going to be thrown out until a Guinness ancestor tasted it and was delighted with the result. Maybe the same development will happen in months to come in relation to the Tayto chocolate bar. Who knows? All I know is that I won't be tasting one of them anytime soon. Neither will I bring a rucksack of them out to friends the next time I'm fortunate enough to visit the New World still touched by so many old tastes. It is indeed a wonderful world. 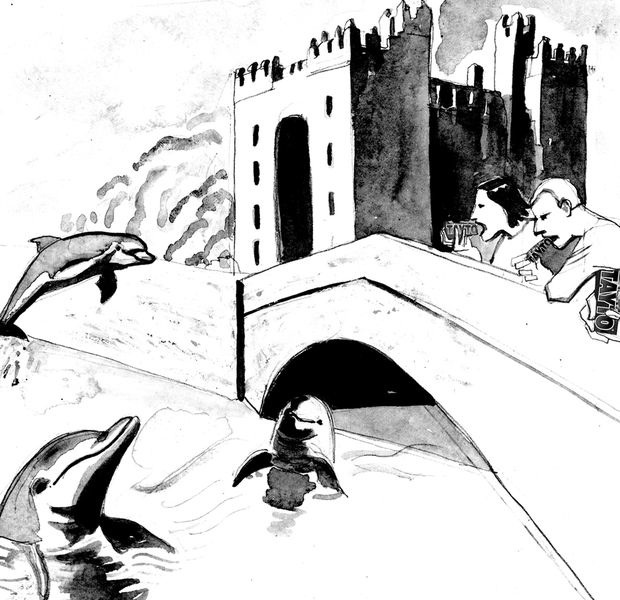 I cannot end without mentioning the beautiful dolphins that have arrived in Bunratty to happily frolic in the muddy tidal waters of the estuary and dine on the finest of young salmon drifting down towards the sea from the upriver spawning beds. I went down to see them but they were sleeping after lunch when I arrived. I'm told that one of them, the biggest one, has already been locally baptized Nellie in honor of fabled Durty Nellie's pub only a few yards away. And the local hope is they will stay for a long time and become as big a tourist attraction as the mighty Fungie below in Dingle in the Kingdom of Kerry. Will the tourists of tomorrow be seen leaning over the stone parapet of the Bunratty bridge awaiting a sighting while munching and crunching away on Tayto chocolate bars? Your guess is at least as good as mine.